Requesting public assistance with theft from pumping station, large spool of copper wire stolen. The Blooming Grove Police Department is currently investigating the theft of a large spool of copper wire from the Water Pump house located on Rt. 208 in the Village of South Blooming Grove. The pump house is located across from Orange and Rockland Utilities and right next to O&R lakes. The theft occurred sometime last Friday (7/25) into Saturday where a large amount of copper wire was stolen from a large wooden spool. A Backhoe was used to lift the wire spool and we believe that a dump truck or large truck of some type was used that was towing the backhoe on a trailer. We are asking the members of the public who might have observed the truck, backhoe or anything that might assist our agency to contact us. Calls will be kept confidential. Note : picture of the backhoe is for reference only, it is not the actual backhoe used. 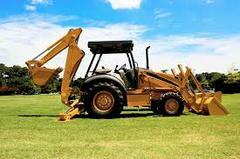 The actual backhoe could have a different color and / or manufacturer.